It’s very common for cats to have watery, goopy or even a little crusty discharge around the eyes. While it typically isn’t something to be concerned about, it can at times indicate an eye problem that needs to be looked at by your veterinarian. There are a few reasons why your cat will have watery eyes, discharge or even eye boogers (those little pesky, crusty hard pieces on the corner of the eyes!). A small amount of cat eye discharge is probably nothing to worry about. If your cat typically has discharge from the eye, which is dry and slightly brown and crusty, it is usually nothing to worry about. While most eye discharge is caused by airborne allergens, just as with humans, most cases concerning pets do not point to a significant problem. However, if your kitty has watery eyes all the time and or any discoloration in the discharge, you should make an appointment to see your veterinarian. 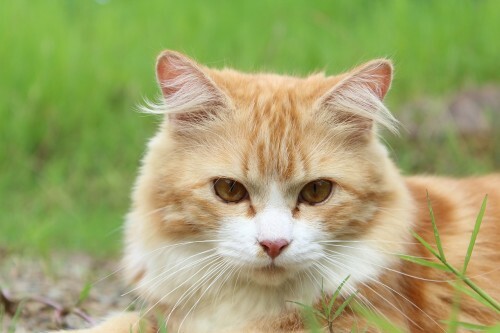 Due to the shape of the face, Persians, Himalayans, some tabbys and other cats with short noses and large, round eyes might have more eye leakage than other cats. This might be normal, but if your cat’s eye discharge is excessive, ask your vet. A daily wipe around the area is typically all you need. Atypical eye discharge is, however, a sign of a problem. In some cases, mucus could be caused by a simple cold or a more serious illness could be the culprit. Clear discharge with no redness or pain points toward a problem in the tear duct department. Clear discharge with redness in the eye could indicate conjunctivitis (commonly known as pink eye), such as from a viral infection. Puslike discharge (green or yellow), sticky and stinky, along with a red eye, could indicate conjunctivitis, such as from a bacterial infection. Discharge accompanied by pain in the eye could be a sign of cornea or inner eye problems. Signs that your cat is in pain may include constantly pawing at her eye, excessive tearing or sensitivity to light. Yellow or green discharge is not normal and indicates a medical issue. Bacteria can breed in mucus and cause eye infections. Check your cat’s eyes often for redness, changes in color or shape, or discharge. Use a soft, wet cloth to gently wipe away any discharge. Make sure to find a cleaner that is labeled as safe to be used around the eyes, and avoid any product that contains alcohol.